I am finally wrapping up my last first week of college. It couldn’t sound like more of a cliche, but I feel like I started my freshman year at Middlebury only yesterday, and it hasn’t sunk in that I’ll be graduating in less than a year. But I’ll save the soppy graduating-senior-blues themed post for later in the year! 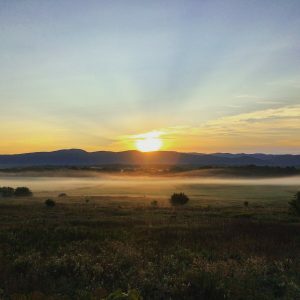 When I signed up to write a blog post about my first week back at Middlebury, I had planned to tell you all about my first week on campus as a freshman and compare it to my first week back as a senior—some kind of reflective exercise that would demonstrate just how far I had come and how much I had matured over the course of my time here. After all, my first week on campus back in 2013 was something of a blurry trainwreck – I was late to just about every single class and was That Freshman who carried around a wallet full of bright green “add” cards for classes that I hadn’t been able to register for. After making my way off the waitlist for a highly coveted class, I managed to sleep through my alarm, missing the class entirely. Needless to say, it was a long week, and one during which I kept my mom on speed dial. But, every cloud has a silver lining—during that chaotic first week, I was directed to multiple classes by helpful professors and students, demonstrating to me what a tight-knit community I had joined. I met one of my closest friends sitting on the floor of a classroom in Twilight Hall, both of us having arrived too late to snag a chair. We still laugh about that fateful encounter today. I wish I could report that as a senior, my first week back on campus after the summer was smooth and painless, and that I appeared to all as the cool, collected and mature adult I had hoped that I would one day become. But, alas, that would have been too easy. I probably shouldn’t have been surprised that my last first week of class bore a strikingly uncanny resemblance to my first first week of class. As a senior, I know I should have this song-and-dance nailed down, but I somehow found myself sprinting across campus to make it to class on time (apparently we have an academic building called Adirondack House.. It was news to me, too!) with a stack of “add” cards in hand. But there have been silver linings to this week, too. Seeing my friends after the summer has been a wonderful reminder of the many incredible relationships I’ve formed over the course of my time at Middlebury, while having the opportunity to discuss my senior thesis ideas with my advisor reminds me of how far I’ve progressed at Middlebury, despite still feeling somewhat like a headless chicken. I’ve accepted that I will probably never have a semester that I don’t start without a stack of add-cards in hand—my curious and indecisive personality combined with the incredible number of interesting courses at Middlebury makes it pretty tough to commit to just four classes. But with the dust finally settling on my first week as a senior, I could not be more excited about all the adventures to come and all the wonderful fall-themed food coming my way. Here is an irrelevant picture of a sunrise over the Green Mountains that I took last week. This entry was posted in Uncategorized on September 20, 2016 by Francesca Conde.